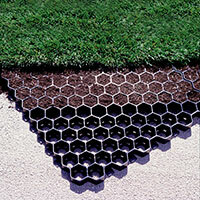 Grass pavers are a honeycomb cell paver that allows for vehicular traffic to drive over and park on turf areas. Our grass pavers are perfect for driveways, parking lots and emergancy access lanes. We sell grass paver in 2' x 2' sections or by the roll. Please call to place your order with free shipping. TuffTrack Grassroad Pavers are a honeycomb cell paver product that allows light to heavy vehicular traffic to drive over turf areas without worry of rutting or damage to the grass. EZ Roll Grassroad Pavers are a load transfer paving system designed to be rolled out over a class II compacted gravel road base, allowing for easy installation. Tufftrack Paver Panels have been designed to help protect and stabilize soil and protect grass roots from heavy vehicle traffic. This particular Tufftrack Paver Panel has been designed to withstand and disperse the weight of heavy construction vehicles and fire trucks. They are the perfect solution for those areas which may deal with heavy vehicle traffic on a regular basis but which still wishes to preserve the aesthetic appeal of grass. Clip design: the Tufftrack Paver Panel is one of only a few panels on the market which currently offer a ‘clip-on’ design. This feature makes installation incredibly easy. It is, simply, a case of slotting the panels together. NDS estimates that this will reduce installation time by as much as 50%. The panels can be clipped together in one of two different configurations. The configuration that you use will be dependent on the situation. Webbed Cell Design: This feature ensures that the fill material that you use is kept firmly in place. Unlike other similar products on the market, you are not going to have to worry about gravel sliding underneath the panel. This, quite often, results in the panel being lifted up from the floor which, ultimately, means that it will need to be reinstalled otherwise it will be unable to provide the stabilization required for a level surface. This web design also ensures that the paver panel can retain a high degree of stability whilst it is being used on slopes. The drainage outlets of the drainer are domed. This allows easy flow of water and nutrients down to the grass roots. This configuration also enables lateral drainage of water. This makes the Tufftrack suitable for rooftop gardens, and even as part of a sophisticated sport’s field drainage system. These pavers have been constructed from 100% recycled plastic. In addition to this, the system has been designed in such a way that storm water is easily filtered through. This reduces the number of pollutants in the area. The Tufftrack Paver can really be put through its paces in a variety of different situations. They are the ideal solution for emergency vehicle access to the roads, construction site entrances, for designing a residential driveway, and even for the creation of overflow parking lots. EZ-Roll Pavers are the ideal solution for those situations where traditional paving methods are not an option, perhaps due to aesthetic appeal, or simply for convenience reasons. This EZ-Roll Paver has been designed to ensure that healthy grass is able to thrive, while at the same time providing a stable surface for vehicular and foot traffic. 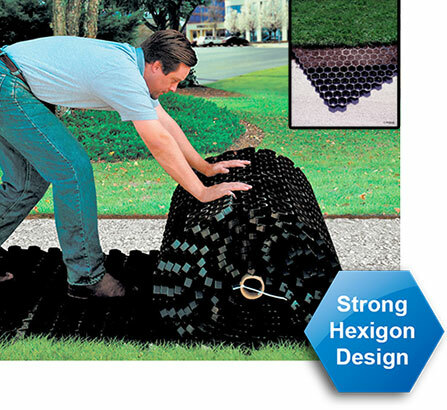 EZ-Roll Grass Pavers have been designed to be simple to install. They are intended for usage in areas which may get a high amount of traffic, from both people and vehicles. Their purpose is to ensure that this heavy traffic does not cause soil compaction or grass root destruction. As mentioned previously, they are suitable for situations where traditional paving methods are not an option. 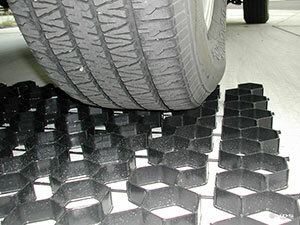 One of the main benefits of the EZ Roll Pavers is the fact that they are incredibly simple to install. They are supplied in a large roll and are un-rolled into place. Theoretically, you could cover a rather large area in minutes. 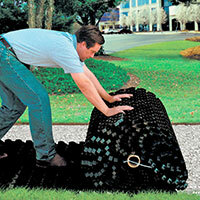 This makes the EZ Roll Paver perfect for situations where time, or perhaps labor, may be at a premium. The cell system of this product has been carefully designed to ensure that the roots of the grass receive the highest level of protection. 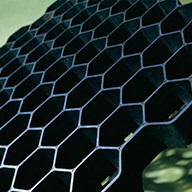 The hexagonal cell structure provides tremendous strength far superior to circle shape based pavers. The empty cells of this product are capable of withstanding a compressive strength of 57,888 psf. This means that they can provide protection from even the largest of vehicles. This protection allows the grass to thrive even when driven on regularly. This paver has been built from 100% recycled plastic. 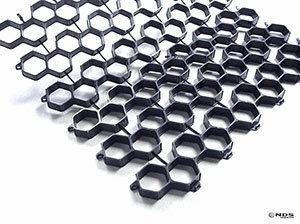 The product has been designed to provide assistance to the drainage system in the area. 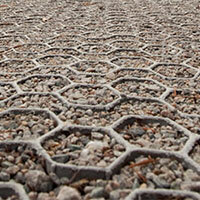 The surface is completely permeable which will, in most cases, eliminate storm water run-off. If you are operating an area which requires aesthetic appeal and permeability but still requires regular access from heavy vehicles or foot traffic, then the EZ Roll Pavers may be an ideal solution.